Modus Statistisch Magazine Jaargang 9 2 Services Services are heterogeneous outputs produced to order and typically consist of changes in the conditions of the consuming units realized by the activities of the producers at the demand of the consumers. Compensation of employees This is defined as the total payment, in cash or in kind, payable by an enterprise to an employee in return for work done by the latter during the accounting period. Property income Property incomes can be defined as the income receivable by the owner of a financial asset or tangible non-produced asset in return for providing funds to or putting the tangible non-produced asset at the disposal of, another institutional unit. Property income can be classified in the System of National Accounts (SNA) as follows: Interest; Distributed income of corporations; and Reinvested earnings on direct foreign investment. Interest Interest is the amount that the debtor becomes liable to pay to the creditor over a given period of time without reducing the amount of prin cipal outstanding. Interest is a fo rm of property income that is receivable by the owners of certain financial assets, such as: Deposits; Securities other than shares; Loans; and other accounts receivable. Distributed income of corporations (Dividends) Dividends are distributed profits and the residual value of the assets of the corporation in the event of its liquidation which the shareholder is entitled as a result of placing funds at the disposal of corporations. Other current transfers These transfers refer to non-life insurance premiu ms and claims, the receipt of development aid for social projects, pensions, and students & family grants. Transactions Developments in 2006 Export of Goods and Services In 2006 the total export of goods has increased from 887 million guilders to 1070 million guilders. This increase is about 182 million guilders (21%) compared to 2005. The highest percentage increase in export of goods is noted in 2006 (Table 1). The export of general merchandis e from Curaao has augmented with more than 87 million guilders in 2006. The increase of 14 percent in export of me rchandise is due to the higher re-exports by freezone companies in the year 2006. During the period from 2000 to 2006 the export of general merchandise has increased with an average of approximately 5 percent. Modus Statistisch Magazine Jaargang 9 4 Import of Goods and Services The total import of goods increases with 10 percent in 2006. Between 2000 and 2006 the highest total import value of 2537 million guilders is noted in 2006 (Table 1). During this period the total import of goods has an average growth of almost 5 percent. The import of general merchandise is remarkably higher in 2006 with a value of 2015 million guilders. This is an increase of 122 million guilders (6%) compared to the previous year. The augmentation in imports is generated by the free-zone companies to meet foreign and domestic demand, the construction activities in the tourism sector, invest ments in the manufacturing industry (oil refinery), and the transportation sector. The oil import for local consumption shows an increa se of 13 percent in 2006. The payments for goods for processing have dropped from 17 million in 2005 to almost 7 million guilders in 2006. Between 2000 and 2006 the average percentage decrease for goods for processing has been almost 27 percent. The goods procured in ports (bunker service) have shown an increase of approximately 42 percent, while the average percentage rate for the period be tween 2000 and 2006 has dropped with almost 12 percent. The total import of services has augmented from al most 818 million in 2005 to 886 million guilders in 2006. This represents an increase of 8 percent. The average percentage growth of the total import of service is almost 3 percent between 2000 and 2006. The foreign exchange outflow from Curaao for paymen ts of transportation services for either air or sea has decreased with 7 million to a value of 114 m illion guilders. The payments of local residents for travel related services (Tourism sector) have in creased with 16 percent in 2006. Between 2000 and 2006 the highest value of 341 million guilders is noticed in 2006 for travel services. The international financial sector fluctuates a lot between 2000 an d 2006. In 2006 the foreign exchange outflow for international financial services has been 122 million gu ilders, which is an increase of almost 18 million guilders (17%) compared to the previous year. Th e compilation item of other services increases with 3 percent in 2006 (Table 1). Primary incomes and current transfers Compensation of employees refers to the earnings of border, seasonal and other workers paid by an employer resident in one economy to employees resident in other economies, such as military personnel abroad, and embassy employees. The comp ensation of employee transfers to Curacao from abroad has increased with nearly 12 million guilder s in 2006. An average growth of about 28 percent is noticed between 2000 and 2006 (Table 2). The transfer of labor income from Curaao to abroad has declined from 6 million to approximately 3 million guilders in 2006. This is a drop of 49 percent in wage transfers of local institutions to workers abroad. The received amount from abroad for property income has augmented with roughly 37 million in 2006. The property income receipts indicate a rise of 22 percent. Modus Statistisch Magazine Nummer 2 en 3 5 In 2006 the interest paid by foreign companies is about 176 million guilders, which is the highest amount paid in the period from 2000 to 2006. The interest income earning by local companies on their foreign deposits has increased with 26 percent comp ared to the year 2005. The received distributed income of corporations (dividend) from abroad has dropped with only 1 percent in 2006. Table 2. ROW: Primary Incomes and Current Transfers Account Use: 2000 2001 2002 2003 2004 2005 2006 D.1 Compensation of employees 9.8 13.2 8.3 9.6 6.3 12.1 23.6 D.4 Property Income 203.1 168.0 151.5 149.5 150.0 170.5 207.4 D.41 Interest 167.8 128.5 116.5 112.4 122.5 138.9 175.5 D.42 Distributed income of corporations 35.3 39.5 35.0 37.1 27.5 31.6 31.9 D.43 Reinvested earnings on direct foreign investment 0.0 0.0 0.0 0.0 0.0 0.0 0.0 D. 52 Current taxes on income, wealth, ets 80.5 86.3 82.2 121.5 99.0 289.0 126.0 D. 7 Other current transfers 307.2 255.6 480.4 470.7 346.1 301.0 309.3 Resource: D.1 Compensation of employees 8.3 7.5 10.4 6.2 2.5 5.7 2.9 D.4 Property Income 110.8 85.3 93.8 109.6 117.2 107.9 146.8 D.41 Interest 76.3 49.7 40.7 49.3 58.6 57.6 78.4 D.42 Distributed income of corporations 32.0 32.6 49.1 56.1 53.3 46.5 61.0 D.43 Reinvested earnings on direct foreign investment 2.5 3.0 3.9 4.2 5.4 3.8 7.4 D.7 Other current transfers 262.6 254.3 317.6 336.8 303.8 344.3 329.0 All values in Mln. Ang. Source: National Accounts Netherlands Antilles 2000-2006, CBS The property income paid to abroad augments from 108 million to 147 million guilders in 2006. Between 2000 and 2006 the property income paid to abroad has an average annual growth of approximately 7 percent. The interest paid to abroad has increased with 36 percent in 2006. This is an augmentation of about 21 million guilders in interest payment to abroad. The transfer of dividend to abroad has augmented with nearly 15 m illion guilders in 2006 (Table 2). The current taxes on income refer to profit taxes paid by offshore companies. The paid taxes from abroad have dropped with 163 million in 2006. The current taxes on income have the highest value of 289 million in 2005, while a drop is noticed of approximately 56 percent in 2006. Due to the tax arrangement within the Kingdom of the Netherlands (BRK) less tax transfers are done in 2006. The other current transfers received from abroad have been 3 percent more in 2006. This is an increase of 8 million guilders in current transfers from ab road. On the other hand the current transfers to abroad have decreased with 15 million to a value of 329 million guilders (Table 2). Modus Statistisch Magazine Jaargang 9 6 Capital Account The Investment grants received from abroad usua lly are development aid for investment projects from the Netherlands. In 2006 the received investme nt grants from abroad has increased with about 9 million guilders (5%). Between 2000 and 2006 the highest investment value is noticed in the year 2006. The average growth rate for this period is 30 percent (Table 3). Table 3. ROW: Capital Account Use: 2000 2001 2002 2003 2004 2005 2006 D.92 Investment grants 54.3 60.3 52.1 54.3 137.2 165.6 174.4 D.99 Other capital transfers 1.7 0.9 2.9 1.8 1.5 0.9 4.2 Resource: D.99 Other capital transfers 0.2 5.0 0.4 3.6 0.0 0.0 0.1 All values in Mln. Ang. Source: National Accounts Netherlands Antilles 2000-2006, CBS Most of the other capital transfers are attributed to migrants transfers to and from countries abroad. In 2006 the other capital transfers to abroad from Curaao have increased fr om about 1 million to 4 million guilders. The other capital transfers from abroad to Cura ao have accumulated to the value of only 100 thousand guilders in 2006. This means more capi tal transfers from abroad have occurred in 2006 compared to the previous year (Table 3). Modus Statistisch Magazine Jaargang 9 8 Het Bruto Binnenlands Product (BBP) wordt gebruikt als indicator voor de economische ontwikkeling van een land. Al naar gelang het BBP gedurende ee n periode stijgt of daalt kan men stellen dat de economie aan het groeien, respectievelijk aan het krimpen is. De BTW van de middenen kleinbedrijven is bij elka ar opgeteld en vergeleken met de totale BBP van Curaao. Dit is gedaan voor de jaren 2001 tot en met 2007 om de ontwikkeling van het aandeel in de economie te bepalen. Om na te gaan wat de bijdrage van het MKB is in elke bedrijfstak, is de BTW van het middenen kleinbedrijf per bedrijfstak bij elkaar opgeteld en vergeleken met de totale BTW in diezelfde bedrijfstak. Dit is gedaan voor de jaren 2001 tot en met 2007 om de relatieve ontwikkeling te laten zien. Deze vergelijking kan niet worden gedaan op het niveau van het BBP, aangezien dit niet per bedrijfstak beschikbaar is, maar alleen voor de totale economie. Definities Kleinbedrijf : dit zijn bedrijven met minder dan 10 personen in loondienst n een omzet van minder dan een half miljoen gulden. Het microbedrijf vormt een onderdeel van het kleinbedrijf. Middenbedrijf : dit zijn bedrijven met tussen de 10 en 50 personen in loondienst f een omzet van tussen de half miljoen en 5 miljoen gulden. Bruto Toegevoegde Waarde (BTW) : de brutoproductie minus het intermediaire verbruik. Brutoproductie : de omzet plus veranderingen in voorrade n. Voor de handel: omzet minus kostprijs (handelsmarge) Intermediaire verbruik : de operationele kosten van een bedrijf, exclusief afschrijvingen, lonen en sociale lasten. Inbegrepen zijn o.a. de kost prijs, utiliteitskosten, transportkosten e.d. Bruto Binnenlands Product (BBP) : de totale productie van goederen en diensten binnen een land. Om het BBP te berekenen wordt de Bruto Toegevoegde waarde van de verschillende sectoren van de economie bij elkaar opgete ld. Deze sectoren omvatten de financile en niet-financil e instellingen, de huishoudens, de non-profit instellingen en de overheid. Van deze Bruto Toegevoegde waarde worden vervolgens de belastingen minus subsidie s op goederen en diensten en de rentemarge afgetrokken om tot het BBP te komen. Nationale Rekeningen : geven de economische transacties weer tussen de sectoren, die in een bepaald jaar in de nationale economie hebben plaats gevonden. De Nationale Rekeningen worden in boekhoudkundige vorm weergegeven. Modus Statistisch Magazine Jaargang 9 12 Ontwikkeling van het aandeel van h et MKB in de brutoproductie per bedrijfstak Om het belang van het middenen kleinbedrijf in an dere variabelen aan te geven is gekeken naar de brutoproductie, loonkosten en investeringen in mate rile vaste activa. Hierna volgt eerst een analyse van het aandeel in de totale brutoproductie (tab el 3), met daarna een beschrijving van de meest opvallende bedrijfstakken. Tabel 3 Ontwikkeling aandeel MKB in de brutoproductie 2006 2007 Brutoproductie Aandeel MKB Brutoproductie Aandeel MKB Totaal MKB Bedrijfstak Totaal Totaal MKB Bedrijfstak Totaal Bedrijfstak mln Naf mln Naf % % mln Naf mln Naf % % Landbouw, veeteelt, visserij 42,4 42,4 100,0 0,9 43,2 43,2 100,0 0,9 Industrie 456,2 210,1 46,0 4,3 486,3 223,4 45,9 4,6 Bouwnijverheid 500,5 309,3 61,8 6,3 500,8 307,2 61,3 6,3 Grooten kleinhandel 769,4 512,0 66,5 10,5 830,1 580,6 70,0 11,9 Horeca 352,8 180,7 51,2 3,7 382,1 197,4 51,7 4,0 Transport en communicatie 705,6 152,1 21,6 3,1 774,3 162,0 22,3 3,3 Financile dienstverlening 969,2 497,0 51,3 10,2 1262,8 615,7 50,3 12,6 Zakelijke dienstverlening 489,4 316,8 64,7 6,5 537,7 367,2 68,7 7,5 en onderwijs Medische en sociale 301,7 77,3 25,6 1,6 323,3 85,8 26,5 1,8 Dienstverlening Overige dienstverlening 298,9 180,0 60,2 3,7 318,3 200,1 62,8 4,1 Totaal 4886,2 2477,6 50,7 50,7 5459,0 2782,6 56,9 56,9 exclusief taxis en buschauffeurs ** exclusief primaire banken *** exclusief huishoudelijke hulpen De bijdrage van het middenen kleinbedrijf in de totale brutoproductie bedraagt in 2007 ruim 57 procent en is ten opzichte van 2006 met 6,2 procentpun ten gestegen (tabel 3). In absolute termen gaat het om een bedrag van 305 miljoen gulden. Financile dienstverlening heeft in 2007 het hoogste aandeel in de totale brutoproductie (12,6%), en is ten opzichte van 2006 met 2,4 procentpunten gestegen. Het MKB in grooten kleinhandel heeft in 2006 het hoogste aandeel in de brutoproductie (10,5 %), maar in 2007 is het aandeel lager dan dat van de financile dienstve rlening (bijna 12%). Ten opzichte van 2006 is er echter wel sprake va n een stijging met 1,4 procentpunten. De andere bedrijfstakken hebben een aandeel dat enkele procenten lager ligt dan genoemde 2 bedrijfstakken. Alle bedrijfstakken laten in 2007 een groei van het aandeel zien in de totale brutoproductie, behalve bouwnijverheid en land bouw, waar het aandeel gelijk is gebleven. In de meeste bedrijfstakken bedraagt het aandeel van het MKB in de brutoproductie per bedrijfstak 50 procent of meer. Alle landbouwbedrijven behore n tot het MKB. Het aandeel van het MKB in de industrie is bijna 46 procent. Tra nsport en communicatie en medische en sociale dienstverlening zijn relatief minder vertegenwoordigd in het middenen kleinbedrijf met respectievelijk 22,3 en 26,5 procent. Modus Statistisch Magazine Nummer 2 en 3 13 Bij bouwnijverheid valt op dat het aandeel van het MKB in de brutoproductie zowel in 2006 als in 2007 ruim 61 procent bedraagt, terwijl het aandeel in de BTW respectievelijk 48 en 47 procent is. De verhouding tussen brutoproductie en intermediaire kosten (voornamelijk grondstoffen) is gelijk aan 0,69 in het middenen kleinbedrijf en 0,47 voor gr ote bedrijven. Nominaal ge zien is de BTW van het MKB gedaald met ongeveer 2 miljoen gulden, maar de totale BTW is bijna gelijk gebleven in beide jaren. In andere bedrijfstakken verschilt het aandeel in de brutoproductie niet zo opvallend veel met het aandeel in de BTW, en is ook de ontwikkeling ervan ongeveer hetzelfde. Het MKB in grooten kleinhandel heeft het hoogste aandeel in de brutoproductie per bedrijfstak (70%), en is ten opzichte van 2006 met 3,5 procen tpunten gestegen. Dit komt ongeveer overeen met de ontwikkeling van het aandeel in de BTW, waarm ee duidelijk is dat het intermediair verbruik evenredig mee is gestegen met de brutoproductie. Nominaal is de brutoproductie van het MKB met bijna 69 miljoen gulden gestegen in 2007. Het aandeel van het MKB in de brutopro ductie van transport en communicatie stijgt in 2007 met bijna 1 procentpunt, terwijl de nominale waarde van de brutoproductie met iets meer dan 25 miljoen gulden stijgt. De brutoproductie van de grote bedrijven stijgt echter met 64 miljoen gulden, zodat het aandeel van het middenen kleinbedrijf slechtsminimaal is in deze bedrijfstak. Het intermediair verbruik van het MKB is mr gestegen dan de brutoproductie, waardoor er minder aan BTW overblijft. De stijging van het intermediair verbruik betreft de overige kosten, zoals utiliteitskosten,communicatie-kosten huur e.d. Het grondstoffenverbruik vertoont een daling in 2007 ten opzichte van 2006. Medischeen sociale dienstverlening laat een stijging zien van het aandeel in de brutoproductie in 2007 (bijna 1 %), terwijl het aandeel in de BTW he tzelfde is gebleven in vergelijking met 2006. Het intermediair verbruik (voornamelijk overige operat ionele kosten) in deze bedrijfstak is sterker gestegen dan de brutoproductie in 2007, vooral in de sociale dienstverlening. Nominaal is de brutoproductie met ruim 8 miljoen gestegen en de BTW met bijna 2,5 miljoen. Modus Statistisch Magazine Nummer 2 en 3 15 Op bedrijfstakniveau gekeken is te zien dat er 5 bedrijfstakken zijn waarvan het aandeel in de loonkosten per bedrijfstak boven de 50 procent zit, waarbij grooten kleinhandel zelfs op bijna 67 procent zit. Overige bedrijfstakken met een aandeel van meer dan 50 procent betreffen de bouwnijverheid en overige dienstverlening (bei den ruim 54 %), zakelijke dienstverlening en onderwijs (ruim 52 %) en financile dienstverlening (ruim 50 %). Hieronder volgt een verdere analyse van deze bedrijfstakken. De loonkosten van het MKB in grooten kleinhandel zijn met ruim 10 miljoen gulden gestegen, en het aandeel in de totale loonkosten van deze bedrijfsta k bedraagt bijna 67 procent in 2007. Ten opzichte van 2006 is er sprake van een daling van het aandeel in deloon kosten met 1,2 procentpunten, aangezien de grote handelsbedrijven mr aan loonkosten hebben uitgegeven in 2007. Het aandeel in de loonkosten va n het MKB in de bouwnijverheid is met bijna 6 procent gestegen ten opzichte van 2006. In guldens komt dit overeen met een stijging van ruim 18 miljoen. Nadere analyse laat zien dat de loonkosten gemiddeld met bijn a 5 duizend gulden per werknemer zijn gestegen. Het aandeel van het MKB in de loonkosten van overige dienstverlening bedraagt ruim 54 procent en is ten opzichte van 2006 met ruim 2 procentpunte n gestegen. Nominaal is er echter nauwelijks verschil tussen 2006 en 2007 maar heeft de stijging van het aandeel te maken met een daling van de totale loonkosten in deze bedrijfstak. Het MKB in zakelijke dienstverlening en onderwijs heeft in 2007 een aandeel van ruim 52 procent in de loonkosten van deze bedrijfstak. Er is spra ke van een lichte daling van het aandeel ten opzichte van 2006 (-1,4%), maar nominaal is er wel een stijging te zien van bijna 4 miljoen gulden. De totale loonkosten zijn gestegen met bijna 13 miljoen gu lden, wat dus voor het grootste gedeelte door de grote bedrijven wordt veroorzaakt. Ondanks dat er een lichte nomina le stijging is van de loonkost en van het MKB in de financile dienstverlening (0,4 miljoen gulden), daalt het aandeel in de totale loonkosten van deze bedrijfstak met ruim 3 procentpunten. De totale loonkosten laten een stijging zien van ruim 31 miljoen gulden. Het zijn vooral de grote offshorebedrij ven die hiervoor verantwoordelijk zijn. Ontwikkeling van het aandeel van het MKB in de investeringen per bedrijfstak De investeringen van een bedrijf bestaan uit invest eringen in materile vaste activa zoals gebouwen en terreinen, transportmiddelen, computers en software, inventaris en equipment. Evenals bij de voorgaande beschrij ving van de variabelen zal ook hi er eerst gekeken worden naar het aandeel van het MKB per bedrijfstak in de totale investeringen en daarna zullen enkele bedrijfstakken worden beschreven die opvallende ontwikkelingen vertonen. Modus Statistisch Magazine Nummer 2 en 3 17 De investeringen van het MKB in industrie is in 2007 toegenomen met bijna 7 miljoen gulden, maar het aandeel is met bijna 10 procentpunten afgenomen. De totale investeringen in deze bedrijfstak zijn met ruim 19 miljoen gulden toegenomen, waarvan dus 12 miljoen voor rekening van de grote bedrijven komt. Het MKB in bouwnijverheid heeft een belangrijk aandeel in de investeringen van deze bedrijfstak, namelijk ruim 70 procent. Ten opzichte van 2006 is er sprake van een daling van bijna 6 procentpunten. Indien wordt gekeken naar de nomi nale bedragen gaat het om een daling van 1,4 miljoen gulden, wat ook bijna het hele verschil is van de investeringen tussen 2006 en 2007. Het aandeel van het MKB in de inve steringen van grooten kleinhandel is in 2007 toegenomen met bijna 20 procentpunten, de nominale stijging bedraagt ruim 11 miljoen gulden. De totale investeringen zijn met ruim 4 miljoen toegenomen, waaruit blijkt dat grote bedrijven minder hebben genvesteerd in vergelijking met 2006. Er wordt vooral genvesteerd in gebouwen door de groothandel. De stijging van de investeringen in horeca is bijna geheel toe te schrijven aan het MKB in eze bedrijfstak (ruim 9 miljoen gulden). Het aandeel van het MKB in de investeringen is dan ook gestegen met ruim 23 procentpunten. Er is vooral genvesteerd in uitbreiding van hotels. Op bedrijfstakniveau is het aandeel van het MKB het hoogst in de financile dienstverlening (bijna 88%), waarbij wel rekening moet worden gehouden da t primaire banken niet zi jn meegeteld. Het zijn vooral de verzekeringsmaatschappijen die inve steren, voornamelijk in gebouwen, computers en inventaris. In vergelijking met 2006 is er een stijging van het aandeel van het MKB in de investeringen van deze bedrijfstak met ruim 34,6 procentpunten. Nominaal gezien gaat het echter slechts om een bedrag van ongeveer 1 miljoen gulden. De totale investeringen zijn gedaald met 11 miljoen gulden, waardoor het aandeel van het MKB zo flink is gestegen. Het middenen kleinbedrijf in zake lijke dienstverlening en onderwijs heeft in 2007 bijna 12,5 miljoen gulden mr genvesteerd dan in 2006. Relati ef is er sprake van een stijging van het aandeel van het MKB met 1,5 procentpunten. De investerin gen van het MKB worden vooral gedaan door de bedrijven in verhuur van onroerend goed. Het aandeel van het MKB in de investeringen van m edische en sociale dienstverlening is in 2007 met ruim 17 procentpunten achteruit gegaan. Nominaal is er sprake van een daling van 2,5 miljoen gulden. Modus Statistisch Magazine Jaargang 9 18 Samenvatting Na een daling van het aandeel van het MKB in de ec onomie in 2006, vertoont 2007 weer een stijging van bijna 1,5 procentpunten. De nominale stijging bedraagt 138 miljoen gulden. Het aandeel van het middenen kleinbedrijf in de totale BTW laat een lichte daling zien van bijna 0,5 procentpunten. De bedrijfstakken met het hoogste aandeel van het middenen kleinbedrijf in de totale BTW zijn financile dienstverlening (bijna 14 %), grooten kleinhandel (r uim 11%) en zakelijke dienstverlening en onderwijs (bijna 8,5%). De mees te bedrijfstakken vertonen geen grote verschillen tussen 2006 en 2007. Op bedrijfstakniveau heeft het middenen kleinb edrijf het grootste aandeel in de BTW in de bedrijfstakken grooten kleinhandel (bijna 68%), zakelijke dienstverlening en onderwijs (65,5%) en overige dienstverlening (ruim 58%). Het aandeel van het MKB in de totale brutoproductie bedraagt bijna 57 procent, hetgeen overeenkomt met een nominale stijging van 305 miljoen gulden. De bedrijfstakken met het hoogste aandeel van het MKB zijn financile dienstverlening (ruim 12,5%), grooten kleinhandel (bijna 12%) en zakelijke dienstverlening en onderwijs (7,5%) Het MKB heeft het hoogste aandeel in de brutop roductie op bedrijfstakniveau in grooten kleinhandel (70%), zakelijke dienstverlening en onderwijs(bijna 69%) en overige dienstverlening (ruim 63%). Dit komt overeen met de bedrijfstakken waarin het MKB het hoogste aandeel heeft in de BTW. Van de totale loonkosten neemt het MKB ruim 48 procent voor haar rekening (ruim 800 miljoen gulden). Bedrijfstakken met het hoogste aandeel van het MKB in de loonkosten zijn grooten kleinhandel (ruim 13%), financile dienstverlen ing (ruim 8%) en zakelijke dienstverlening en onderwijs (7%). Indien wordt gekeken naar het aandeel van het MKB per bedrijfstak heeft ook hier grooten kleinhandel het hoogste aandeel (bijna 67%). Hierna volgen overige dienstverlening en bouwnijverheid (beiden ruim 54%). Het middenen kleinbedrijf heeft een aandeel van 46 ,5 procent in de totale investeringen. Het gaat hierbij om een bedrag van 154 miljoen gulden. Bedrijfstakken met het hoogste aandeel van het MKB zijn zakelijke dienstverlening en onderwijs (ruim 16%), grooten kleinhandel (bijna 8%) en financile dienstverlening (ruim 5%). Op bedrijfstakniveau heeft het middenen kleinbedri jf het grootste aandeel in de investeringen in de bedrijfstakken financile dienstverlening (bijna 88 %), zakelijke dienstverlening en onderwijs (ruim 76,5%) en bouwnijverheid (ruim 70%). Modus Statistisch Magazine Jaargang 9 20 waarbij de basisreeksen eveneens onderling vergelijkbaar gemaakt worden door ze te zuiveren voor seizoensinvloeden, maand-op-maand fluctuaties (ruis), en de eventuele trendmatige ontwikkeling. De Conjunctuurenqute zoals die in de Nederlandse Anti llen wordt gehouden is min of meer gebaseerd op de methodologie van de conjunctuurenqute die door de Europese Gemeenschap maande lijks wordt uitgevoerd. De vraagstelling is evenwel simpeler en aangepast aan de lokal e behoeften, en de frequentie is tweemaal per jaar. Een hogere frequentie is om praktische redenen niet haalbaar gebleken. Door deze lagere frequentie is de mogelijkheid om voorspellende trends te ontdekken zoals bij de leading indicators van het CPB, geringer. Opinievragen als conjunctuurindicatoren De rele gegevens uit de Conjunctuurenqute worden gebruikt voor voorlopi ge berekeningen van de toegevoegde waarde van de sector Niet-Financile bedrijven. De opinievragen in de enqute zijn tot nu toe gebr uikt om de stemmingen van ondernemers te meten. De resultaten daarvan zijn in voorgaande afleveringen van Modus gepresenteerd. In dit artikel worden drie van de opinievragen ui t de enqute onderzocht op relevantie ten aanzien van de ontwikkelingen in de economie. Gekozen is voor de drie vragen die het meeste betrekking hebben op de conjuncturele situatie: het vertro uwen in de economie, het oordeel over het investeringsklimaat, en het vertrouwen in de toekomst. De drie vragen worden eerst, kort, afzonderlijk behandeld. Vervolgens worden de uitkomsten van de vragen gestandaardiseerd om onderlinge vergelijkbaarheid te bewerkstelligen en de conjunctuurgevoeligheid te kunnen beoordelen. Voor de conjunctuurgevoelige indicatoren wordt tenslotte een vergelijking gemaakt met ontwikkelingen in het Bruto Binnenlands Product (BBP) Vertrouwen in de economie De uitkomsten met betrekking tot de vraag: het ve rtrouwen in de economie is in vergelijking met een half jaar geleden: verminderd, gelijk gebleven of verbeterd zijn in figu ur 1 gepresenteerd. Deze uitkomsten hebben betrekking op de enqutes di e tussen december 2004 en december 2008 zijn gehouden. Wat opvalt is dat het percentage ondernemers dat aa ngeeft dat het vertrouwen is verbeterd, tot en met december 2007 behoorlijk is toegenomen. In de twee onderzoeksperioden daarna is dit percentage weer flink afgenomen. Modus Statistisch Magazine Jaargang 9 22 Vertrouwen in de toekomst De derde en laatste vraag die in deze analyse gebrui kt wordt luidt als volgt: De onderneming ziet de toekomst met vertrouwen tegemoet: ja, nee, geen mening. Zoals uit figuur 3 blijkt is ook hier een enigszin s vergelijkbare ontwikkeling zichtbaar als bij de twee vorige indicatoren, met als bijzon derheid dat het vertrouwen al vana f de eerste waarneming hoger is dan bij de twee andere vragen, en ook hoger blijft. Hier zijn ondernemers die geen oordeel hebben in de minderheid, waardoor de verschillen tussen wel en geen vertrouwen duidelijker zijn. Figuur 3 V ertrouwen toekomst, Curaao 0% 20% 40% 60% 80% 100% dec04 jun05 dec05 jun06 dec06 jun07 dec07 jun08 dec08 nee neutraal ja Ombouw naar conjunctuurindicatoren In figuur 4 zijn de positieve en negatieve antwoorde n op de drie opinievragen gestandaardiseerd. De neutrale antwoorden (gelijk, mati g, neutraal) worden daarbij niet meegenomen. Er wordt een index geconstrueerd uit het percentage positieve antwoorde n ten opzichte van alle positieve en negatieve antwoorden. Een score van 50 geeft dan aan da t de antwoorden van de ondernemers gelijk verdeeld zijn tussen positief en negatief, en alle waarden boven de 50 geven aan dat ondernemers in meerderheid positief zijn. De methode zorgt er voor dat er geen negatiev e uitkomsten kunnen ontstaan en dat de reeksen onderling vergelijkbaar zijn. Modus Statistisch Magazine Nummer 2 en 3 23 Figuur 4 Conjunctuurindicatoren Curaao0 25 50 75 100 dec04 jun05 dec05 jun06 dec06 jun07 dec07 jun08 dec08 vertr.toekomst invest.klimaat ondern.vertrouwen Uit figuur 4 blijkt dat de oordelen van ondernemers bij alle drie de indicatoren vanaf het begin van de waarnemingen in Curaao een sterk positieve tren d te zien hebben gegeven tot en met december 2007. Met name in 2007 overheerste in alle indi catoren het positieve oordeel, dat wil zeggen: de indices komen boven de score van 50 uit. Ten aanzien van het vertrouwen in de toekomst is de score vanaf het begin boven de 50 gebleven, en is van daaruit verder toegenomen. In de loop van 2008 is met name in het vertrouwen in de economie een scherpe daling te ontdekken. De internationale economische crisis is dan al in volle gang en de ondernemers geven daarmee aan dat ook in Curaao de invloed hiervan merkbaar is. Opmerkelijk is dat het oordeel omtrent het invester ingsklimaat aanmerkelijk minder snel daaldt. Het vertrouwen in de toekomst daalt zelfs helemaal niet. De correlatie tussen het oordeel omtrent het invester ingsklimaat en het vertrouwen in de toekomst (R=0,90) is groter dan de correlatie tussen het oordeel omtrent het investeringsklimaat en het ondernemersvertrouwen (R=0,72). De conclusie lijkt daarmee gerechtvaardigd dat de ondernemers in hun beslissingen om te investeren zich meer la ten leiden door de toekomstverwachtingen dan de beoordeling van de huidige economische situatie. Ondernemers in Curaao hebben, naar het zich la at aanzien, altijd een positiever beeld van de toekomst ten opzichte van de huidige situatie. Di t kan een bias in de voorspellende waarde van deze conjunctuurindicator betekenen. Om de invloed van de bias te elimineren zijn in de volgende figuur de data herberekend als indices van de afwijkingen van de (lineaire) trend (trend=100). Modus Statistisch Magazine Jaargang 9 24 Figuur 5 Conjunctuurindicatoren Curaao afwijkingen van de trend40 60 80 100 120 140 160dec-04 ju n -0 5 dec-05 ju n 06 dec-06 ju n 07 dec-07 j u n 08 dec0 8 invest.klimaat ondern.vertrouwen vertr.toekomst Uit deze opstelling wordt meer duidelijk dat alle drie indicatoren gelijkaardig bewegen, maar dat de heftigheid van de bewegingen sterk verschillen. Zo fluctueert het ondernemersvertrouwen veel sterker dan het vertrouwen in de toekomst. Deze laat ste kent een hoge trendcorrelatie, hetgeen er op kan duiden dat er een langere periode van waarne mingen nodig is om de bruikbaarheid van de indicator te testen. Voor de korte termijn is de bruikbaarheid daardoor verminderd. Omdat het hier een beperkte reeks waarnemingen betreft en de brui kbaarheid dus nog niet te testen valt, is deze indicator niet opgenomen in de navolgende grafiek. Figuur 6 Conjunctuurindicatoren en BBP, Curaao 0 25 50 75 100 2005200620072008 0 1 2 3 4 % index onder.vertr. index invest.klimaat mutatie bbp (rechterschaal) In figuur 6 worden de indicatoren ondernemersver trouwen en investeringsklimaat vergeleken met de rele mutaties van het Bruto Binnenlands Product (BBP) van Curaao. Modus Statistisch Magazine Nummer 2 en 3 25 Aangezien de mutatiecijfers van het rele BBP jaargegevens betreffen, zijn de conjunctuurindicatoren voor dit doel omgezet naar jaarcijfers. Di t is gedaan door de junicijfers van elk jaar te middelen met de twee omringende decembercijfers. Deze methode geldt als een benadering voor een jaargemiddelde, aangezien de waarden voor de tussenliggende maanden uiteraard niet bekend zijn, en deze nu lineair worden gemputeerd. Daardoor wordt eveneens een eventueel seizoenseffect uitgesloten. Uit figuur 6 wordt duidelijk dat de bewegingen in de conjunctuurindicatoren de mutaties in het BBP goed volgen. Dat geldt in meerdere mate voor het ondernemersvertrouwen, en in mindere mate voor het investeringsklimaat, maar dat laatste kan verklaard worden door het eerder veronderstelde grotere verband tussen het investeringsklimaat en de toekomstverwachtingen. Evaluatie Met behulp van een vrij korte reeks zijn drie opinievragen uit de Conjunctuurenqute onderzocht op relevantie als conjunctuurindicatoren. Er is in a lle drie reeksen een duidelijke ontw ikkeling waarneembaar die, als deze vergelijkbaar worden gemaakt met de beschikbare rele indicator (jaarlij kse BBP mutaties) de ontwikkelingen in deze laatste goed volgen. Daarbij is vooral het ondernemersvertrouwen in de huidige economische situatie richtinggevend. Het investeringsklimaat en het vertrouwen in de toekomst zouden verder kunnen worden onderzocht op hun functie als leading indicator. Dat zou op modelmatige wijze verder kunnen worden ontwikkeld. Daarvoor zijn echter op dit moment de tijdreeksen te kort. Ook zou de frequentie van waarneming opgevoerd moeten worden om de mate van vooruitlopen goed te kunnen vaststellen. Modus Statistisch Magazine Jaargang 9 26 Ondernemersklimaat Bedrijven zijn de primaire bron van economische groei en werkgelegenheid in elk land. De wijze waarop bedrijven kunnen bijdragen aan de inko mensvorming is naast het handelen van de ondernemer ook afhankelijk van de omstandigheden waaronder het bedrijf kan worden uitgeoefend. In het algemeen worden die omstandigheden samengevat onder de noemer ondernemersklimaat of investeringsklimaat. Het ondernemersklimaat wordt in de internationa le literatuur omschreven als de combinatie van factoren die van invloed zijn op de bedrijvigheid en inkomensvorming van bedrijven. Daaronder vallen factoren die vast staan en niet benvloedbaar zijn door overheidsbeleid, zoals de geografische situatie (klimaat, beschikbaarh eid van natuurlijk e hulpbronnen, omvang van de interne markt en afstand tot andere markten). Me t niet benvloedbaar wordt hier bedoeld dat de omstandigheden niet gewijzigd kunnen worden. Daarnaast zijn er factoren die wel degelijk benvloedbaar zijn en daardoor onderdeel van actief overheidsbeleid kunnen zijn. Belangrijke fact oren die genoemd worden zijn adequate infrastructuur, sociaal-economisch beleid (arbei dsmarktbeleid), de kwaliteit van de financile instituties en de betrouwbaarheid van de overheid. Tegenwoordig wordt in dit rijtje ook steeds meer genoemd human capital (kennis), technologie en innovatie. In diverse landen in Europa en door institut en als het World Economic Forum en de OECD worden deze factoren ingebed in een theoreti sch kader waarbinnen voor het land of voor vergelijkbare landen de mogelijkheden en de uitdagingen voor economische groei en welvaart zichtbaar worden. Voor bovengenoemde factoren worden relevante indicatoren in de analyse van het ondernemersklimaat opgenomen. Zo zouden voor de factor Human Capital als indicatoren kunnen worden opgenomen het percentage hoogop geleiden, volwasseneneducatie, uitgaven aan onderwijs, productiviteit. De uitkomsten kunnen worden vergeleken in de tijd, en ook met landen die min of meer vergelijkbaar zijn of die een vergelij kbare concurrentiepositie innemen. In Ierland wordt al jaren een internationale vergelijking gemaakt van het investeringsklimaat door de National Competitiveness Council op basis van een theoretisch model waarin 140 statistische indicatoren worden gebruikt. In Nede rland wordt sinds kort een publicatie over het ondernemingsklimaat verzorgd, in een systeem dat gebaseerd is op het Ierse model, waarin 100 indicatoren zijn opgenomen. De uitkomsten geven handen en voeten aan een ui t te voeren overheidsbeleid ter verbetering van het ondernemersklimaat. De in het begeleidende artikel genoemde conjunctuurindicatoren meten in al g emene termen de uitkomsten van der g eli j k beleid. Modus Statistisch Magazine Jaargang 9 28 29 Procent acht de kans dat men over de komende twaalf maanden het slachtoffer kan worden van inbraak groot tot zeer groot. Ruim een derde deel ( 34%) vindt dat de politie ge en goed werk verricht. Sint Maarten Ten aanzien van het beeld dat de resp ondenten hebben over de mate va n veiligheid in hun buurt, blijkt dat 30 procent weleens bang is om alleen thuis te zijn. Bijna twee derde deel, 64 procent, is vooral 's avonds bang, 18 procent is altijd bang en 18 procen t heeft geen mening. Ruim de helft (54%) is van mening dat men elkaar meestal wel een hand helpt. 46 Procent vindt dat men elkaar niet steunt in de buurt. Van de ondervraagden vindt meer dan een derd e deel (37%) de buurt een beetje onveilig tot zeer onveilig. 28 Procent van de respondent en heeft de laatste keer dat men 's avonds in de buurt uitging bepaalde straten of plekjes gemeden en 18 procen t heeft uit veiligheidsoverw eging iemandmeegenomen. Op de vraag hoe groot men de kans inschat dat men over de komende twaalf maanden het slachtoffer kan worden van inbraak, antwoordt 44 procent dat de kans groot to t zeer groot is. Een meerderheid (63%) meent dat de politie geen goed werk verricht. Tabel 1. Onveiligheidsperceptie algemeen, in procenten Bonaire Curaao Sint Maarten Weleens bang om alleen thuis te zijn 16 17 30 Vindt buurt niet sociaal 47 53 46 Buurt een beetje onveilig tot zeer onveilig 31 50 37 Bepaalde plekjes gemeden 17 23 28 Uit veiligheidsoverweging iemand meegenomen 11 17 18 Kans op inbraak groot tot zeer groot 23 29 44 Niet tevreden met werk van de politie in de buurt 37 34 63 Bron: Slachtofferenqute 2008 Onveiligheidsgevoel in rel atie tot slachtofferschap In deze paragraaf wordt ingegaan op de onveilighei dsperceptie van respondenten die al dan niet het slachtoffer zijn geweest van een misdrijf het hu ishouden aangaande. Logischerwijs wordt alleen gekeken naar misdrijven waarvan het huishouden slachtoffer wordt, daar het huishouden immers gelinkt is met de buurt waar het betreffende misdrijf al dan niet heeft plaatsgevonden. In dit artikel is een zevental indicatoren gebruikt voor de mate va n onveiligheidsperceptie. Het percentage ja-zeggers geeft de mate aan waarin men de buurt onveilig acht. Het onveiligheidsgevoel wordt als indicator beschouwd voor de onveiligheid in de buurt. Slacht offers en geen slachtoffers worden per indicator telkens met elkaar vergeleken op grand van de mate waarin men aangeeft een onveiligheidsgevoel (antwoord is ja) te hebben. Uit tabel 2 blijkt dat over het geheel genomen de slachtoffers in vergelijking tot degenen die geen slachtoffer zijn, in hogere mate hun buurt onveilig vindt. Dat hier mee gelijk gezegd kan worden dat onveilige buurten meer last hebben van criminaliteit is onjuist, daar geen uitspraak gedaan kan worden over de richting van het verband. Het feit dat iemand juist vanwege de ervaring met criminaliteit in de buurt een onveilig gevoel krijgt, is even goed mogelijk. Er kan in ieder geval een verband geconstateerd worden tussen onveiligheid in de buurt en slachtofferschap, in die zin dat in geval van slachtofferschap het gevo el van onveiligheid groter is. Hoewel de percentages per indicator per eiland kunn en verschillen, kan voor alle eilanden gesteld worden dat een verband bestaat tussen sl achtofferschap en on veiligheidsgevoel. Modus Statistisch Magazine Nummer 2 en 3 29 Tabel 2. Onveiligheidsperceptie en slachtofferschap, in procenten Inbraak Poging tot inbraak Diefstal uit tuin, erf, porch slachtoffer geen slachtoffer slachtoffer geen slachtoffer slachtoffer geen slachtoffer Onveiligheid buurt ja nee ja nee ja nee ja nee ja nee ja nee Onveiligheidsindicatoren Bonaire Bang alleen thuis 23 77 14 86 26 74 15 85 23 77 14 86 Buurt niet sociaal 47 53 46 54 66 34 45 55 48 52 46 54 Onveilig gevoel buurt 37 63 29 71 37 63 30 70 37 63 29 71 s Avonds alleen uit in de buurt 25 75 19 81 29 71 19 81 31 69 18 82 Vergezeld uitgaan 's avonds 12 88 14 86 24 76 12 88 18 82 12 88 Grote kans op inbraak 38 62 24 76 45 55 25 75 42 58 24 76 Politie doet niet genoeg 71 29 60 40 68 32 62 38 73 27 60 40 Curaao Bang alleen thuis 19 81 16 84 18 82 17 83 17 83 17 83 Buurt niet sociaal 59 41 51 49 56 44 53 47 58 42 52 48 Onveilig gevoel buurt 59 41 47 53 63 37 48 52 58 42 48 52 s Avonds alleen uit in de buurt 36 64 28 72 40 60 28 72 35 65 28 72 Vergezeld uitgaan 's avonds 23 77 21 79 29 71 20 80 26 74 20 80 Grote kans op inbraak 52 48 28 72 47 53 33 67 46 54 32 68 Politie doet niet genoeg 71 29 63 37 71 29 65 35 68 32 65 35 Sint Maarten Bang alleen thuis 32 68 29 70 32 68 29 71 30 70 30 70 Buurt niet sociaal 53 47 44 56 47 53 46 54 51 49 45 55 Onveilig gevoel buurt 44 56 36 64 48 52 36 64 49 51 35 65 s Avonds alleen uit in de buurt 37 63 35 65 48 52 34 66 47 53 33 67 Vergezeld uitgaan 's avonds 25 75 22 78 29 71 22 78 25 75 22 78 Grote kans op inbraak 70 30 54 46 71 29 56 44 75 25 54 46 Politie doet niet genoeg 71 29 62 38 76 24 62 38 78 22 61 39 Bron: Slachtofferenqute 2008 Conclusie Onderling zijn ten aanzien van de veiligheidsindicatoren verschillen tussen de eilanden voor wat betreft de mate van onveiligheidsperceptie va n respondenten van hun buurt. De percentages verschillen. Voor alle eilanden is echter sprake van een verband tussen veiligheidsperceptie en slachtofferschap. Wanneer men voor de onveilighe idsindicatoren het aandeel ja-zeggers bij de slachtoffers vergelijkt met het percentage ja-zegge rs bij de respondenten die geen slachtoffer zijn geweest van de betreffende misdrijv en, constateert men dat bij de sl achtoffers de percentages hoger liggen dan bij de geen slachtoffers Slachtoffers uiten een hogere mate van onveiligheidsgevoel dan geen slachtoffers. Modus Statistisch Magazine Jaargang 9 30 Vacature eigenschappen van de meest voorkomende beroepen op de arbeidsmarkten van Curaao, Bonaire en Sint Maarten. Zaida Lake Inleiding In maart 2006 heeft het Centraal Bureau voor de Statisti ek een Vacatureonderzoek in Curaao, Bonaire en Sint Maarten gehouden. Het Vacatureonderzoek is een onderzoek onder bedrijven met het doel om de omvang en structuur van de vacatures op de arbeidsmarkt te meten. Vacature eisen zullen afhankelijk van de beroepsgroep weinig veranderen. Dit is bijvoorbeeld het geval bij vacatures voor hooggeschoolde beroepen, waarbij over het algemeen het hebben van diploma nog altijd een belangrijke vereiste is. Dit artikel heeft als doel om aan de hand van de resu ltaten van het Vacatureonderzoek van 2006, de vacature eigenschappen van de meest voorkomende beroepsgroepen op de arbeidsmarkten van de drie eilanden te analyseren. Tevens zullen de result aten van de verschillende eilanden met elkaar worden vergeleken. Het gaat in totaal om drie gekozen beroepsgroepen, te weten: Managers/Deskundigen/Assistent deskundigen, Vak en Handwerklieden, en Supervisors/Klerken/Dienstverlenende beroepen. De groep Overig in de tabellen is in dit geval een restpost en zal niet in de beschrijvingen worden meegenomen. De vacatureeigenschappen die in de analyse zullen worden betrokken, zijn: het wel of niet hebben van een diploma, het wel of niet hebben van werkervaring, aantal werkuren per week, economische positie behorend tot de vacature het wel of niet lokaal moeilijk op te vullen van de vacature. Modus Statistisch Magazine Nummer 2 en 3 31Methodologie De beroepsclassificatie is ontleend aan de ISCO-88. Kenmerkend voor de ISCO classificatie is dat de beroepsgroepen oplopen van beroepen met relatief lage opleidingseisen, zoals de Vakkundige beroepen, naar beroepen met relatief hoge opleidingseisen zoals Deskundigen. De resultaten van het Vacatureonderzoek van Curaao zijn aangepast aan de gewijzigde bevolkingscijfers van 2006 en de totalen zullen derhalve enigszins afwijken van al eerder gepubliceerde cijfers. In de analyse is gebruik gemaakt van percentages in plaats van absolute aantal len vanwege de relatief kleine aantallen, en om de vergelijking tussen vers chillende eilanden, te ku nnen maken. In de tekst worden per eiland allereerst de verschillen in de totale percentages beschreven en daarna de percentages per beroepsgroep. Er is voor dit artikel niet gekeken naar het signific antie niveau van de uitspraken (de Chi-square). De uitspraken zijn derhalve slechts indicatief Vacature eisen per beroepsgroep 2006 Vacature eis wel of geen diploma En van de vragen die in het Vacatureonderzoek word t gesteld is de vraag of bij de invulling van de vacature een diploma wordt vereist. Tabel 1 Vacatures per beroepsgroep naar wel of geen diploma vereist, 2006 Bonaire Curaao Sint Maarten Wel GeenTotaal WelGeenTotaalWel Geen Totaal Managers/Deskundigen/ Assistent deskundigen 77 23 100 89 11 100 89 11 100 Supervisors/Klerken/ Dienstverleners 65 35 100 39 61 100 54 46 100 Vak en Handwerklieden 9 91 100 31 69 100 5 95 100 Overig 7 93 100 20 80 100 4 96 100 Totaal 28 72 100 50 50 100 37 63 100 Uit tabel 1 blijkt dat per eiland de antwoorden verschillen. In Curaao is de verdeling tussen de vereiste van het wel en het niet hebben van een di ploma gelijk verdeeld De helft van de vacatures vereist wel een diploma en de andere helft niet. Vo or Sint Maarten liggen de percentages verder uit elkaar; 63 procent vereist geen diploma terwijl voor 37 procent van de gevallen dit wel het geval is. In Bonaire liggen de percentages het verst uit elkaar Bij bijna driekwart van de vacatures wordt geen diploma vereist, bij ruim een kwart wel. De bovengenoemde percentages worden benvloed door het type beroep. Voor alle eilanden geldt dat de overgrote meerderheid van de vacatures voor Managers, Deskundigen en Assistent deskundigen wel een diploma wordt vereist (77 procent voor Bo naire, 89 procent voor zowel Curaao als Sint Maarten). Modus Statistisch Magazine Jaargang 9 32 Aan de andere kant geldt voor alle eilanden da t de overgrote meerderheid van de vacatures voor Vaken Handwerklieden juist geen diploma wordt ve reist. Dit geldt overigens in mindere mate voor Curaao (69 procent) dan voor de andere eilanden. Voor wat betreft de vacatures voor Supervisors, Kl erken en Dienstverleners zijn er grote verschillen tussen de eilanden. Voor de arbeidsmarkt van Cu raao geldt dat voor 61 pr ocent van de vacatures voor beroepen in deze beroepsgroep geen diploma wordt vereist. Het tegenove rgestelde is waar voor Bonaire. Vijf en zestig procent vereist wel een diploma. In Sint Ma arten liggen, wat deze beroepsgroep betreft, de percentages niet ver ui t elkaar (respectievelijk 54 wel en 46 procent geen diploma). Vacature eis naar werkervaring Een tweede belangrijke vereiste voor verschillende be drijven is dat de kandidaat werkervaring heeft. Tabel 2 geeft een overzicht van de mate waarin dat per eiland verschilt. Tabel 2 Vacatures per beroepsgroep naar wel of geen werkervaring vereist, 2006 Bonaire Curaao Sint Maarten Wel GeenTotaal WelGeenTotaal Wel Geen Totaal Managers/Deskundigen/ Assistent deskundigen 63 37 100 75 25 100 84 16 100 Supervisors/Klerken/ Dienstverleners 48 52 100 60 40 100 76 24 100 Vak en Handwerklieden 98 2 100 77 23 100 57 43 100 Overig 53 47 100 33 67 100 69 31 100 Totaal 75 26 100 64 36 100 70 30 100 Bij de meeste vacatures wordt wel werkervaring ve reist. Dit geldt vooral voor Bonaire en Sint Maarten. Voor Sint Maarten geldt, dat bij 70 proc ent van de vacatures werkervaring wordt vereist In Bonaire is dat driekwart en in Curaao 64 procent. Een nadere beschrijving per beroepsgroep en per ei land laat zien dat vacatu res voor hooggeschoolde beroepen (Managers, Deskundigen en Assistent desk undigen) werkervaring ee n belangrijke vereiste is op alle eilanden. Voor wat betreft de beroepsgroep Vaken Handwerk lieden, wordt werkervaring op alle drie eilanden in verschillende mate vereist. Opvallend is het hoge percentage (98%) van Bonaire in vergelijking met de 77 procent voor Curaao en 57 procent voor St.Maarten.. Bij de vacatures voor Supervisors, Klerken en Dien stverleners, wordt in Si nt Maarten meer nadruk gelegd op werkervaring (76 procent) dan op de ande re eilanden (respectievelijk 48 procent in Bonaire en 60 procent in Curaao). In Bonaire weegt ke nnelijk het hebben van een diploma zwaarder dan werkervaring, wat dit type beroepen betreft. Modus Statistisch Magazine Nummer 2 en 3 35 De antwoorden in Bonaire wijken behoorlijk af van di e van de overige eilanden. Uit de resultaten in tabel 5 komt naar voren dat in Bonaire 78 procent va n de vacatures, naar de mening van de bedrijven, lokaal moeilijk zijn op te vullen. In Curaao liggen de verhoudingen heel anders. Slechts 35 procent van de vacatures is lokaal moeilijk op te vullen. Sint Maarten registreert iets meer moeilijk op te vullen vacatures dan Curaao, namelijk 59 procent, maar ligt nog steeds ver beneden het niveau van Bonaire. Bij nadere analyse op het niveau van de beroepsgroepen, blijkt dat voor wat betreft de beroepsgroep Managers, Deskundigen en Assistent deskundigen de arbeidsmarkt van Bonaire afwijkt van de arbeidsmarkten van Curaao en Sint Maarten. Want uit tabel 4 blijkt dat 70 procent van de vacatures voor dit type beroep volgens de bedrijven lokaal niet moeilijk is op te vullen. In Curaao ligt het percentage op ruim de helft en in Sint Maarten blijkt het tegenovergestelde, namelijk 60 procent.. Vacatures voor Vaken Handwerklieden blijkt in Bonaire wel moeilijk op te vullen zijn (95 procent). Dit geldt ook voor Sint Maarten (88 procent). In Cura ao is de situatie juist omgekeerd. De vacatures zijn voor de meerderheid (55 procent) lokaal niet moeilijk op te vullen. Voor alle drie eilanden geldt da t vacatures voor Supervisor, Klerken en Dienstverleners lokaal niet moeilijk zijn op te vullen. De percentages liggen pe r eiland niet ver uit elkaar. Enige uitzondering vormt Sint Maarten, waar ongeveer 60 procent lokaal wel moeilijk is op te vullen. Samenvatting Dit artikel heeft als doel om de vacatures in Curaa o, Bonaire en Sint Maarten, op het niveau van de beroepsgroepen, te beschrijven. De nadruk lig t op het beschrijven van de eigenschappen van vacatures voor de meest voorkomende beroepsgro epen op de drie arbeidsmarkten. Deze zijn Managers, Deskundigen en Assistent deskundige n, Vaken Handwerkliedenen Supervisors, Klerken en Dienstverleners. De vacature eigenschappen die worden onderzocht zi jn het wel of niet vereisen van een diploma, het wel of niet vereisen van werkervaring aantal we rkuren per week, economische positie en of de vacatures lokaal wel of niet moeilijk zijn te vullen. Uit de resultaten is naar voren gekomen dat voor wat betreft de beroepsgroep Managers, Deskundigen en Assistent deskundigen in nagenoeg alle eilanden nadruk li gt op het hebben van een diploma. Ook het hebben van werkervaring we egt mee, zei het, minder in Bonaire dan in de andere drie eilanden. Voor de meeste vacatures in deze beroep sgroep geldt tevens dat deze 40 urige werkweek vereisen. Dit geldt vooral voor Curaao en Sint Maarten en in mindere mate voor Bonaire. De meeste vacatures in Curaao en Bonaire betreft een vaste dienst aanstellin g. In Sint Maarten is juist het tegenovergestelde het geva l; het overgrote deel betreft geen vaste dienst, maar contract. Vacatures voor dit type beroep zijn in Bonaire en in Curaao lokaal niet moeilijk op te vullen, maar in Sint Maarten juist wel. Modus Statistisch Magazine Jaargang 9 36 Vacatures voor Vaken Handwerklieden, vereisen voor het overgrote deel ge en diploma. Dit vooral voor Bonaire en Sint Maarten. Daarentegen is werkervaring wel een grote vereiste, vooral in Bonaire. Voor nagenoeg alle vacatures geldt een 40 urige werkweek of langer. Het grootste gedeelte betreft geen vaste dienst aanstelling, behalve in Sint Maarten. In Bonaire en Sint Maarten vindt het grootste gedeelte van de bedrij ven dat vacatures voor Vaken Handwerklieden lokaal moeilijk zijn op te vullen. In Curacao is het aandeel minder. De beroepsgroep Supervisors, Klerken en Dienstverl eners wijken op bijna alle eigenschappen af van de overige twee beroepsgroepen. Er wordt weinig nadruk gelegd op het hebben van een diploma. Ook werkervaring wordt minder vere ist, behalve in Sint Maarten. De meeste zijn gebaseerd op een 40-urige werkweek of langer. Dit geldt voor alle drie eilanden in nagenoeg dezelfde mate. Ongeveer de helft betreft geen vaste dienst.Dit geld t nagenoeg voor alle drie eilanden, maar meer in Bonaire. Ten aanzien van de moeilijkheidsgraad om deze type vacatures lokaal op te vullen, vindt iets minder dan de helft van de bedrijven in Bonaire dat deze lokaal niet moeilijk is op te vullen. In Curaao en in Sint Maarten is een grotere meerderheid deze mening toegedaan. Modus Statistisch Magazine Nummer 2 en 3 37 Verkeer en verkeersveiligheid in Curaao Ellen Maduro Inleiding In het Modus Statistisch Magazine jaargang 7, numm er 4 is aandacht besteed aan het verkeer in Curaao van de periode 2002-2006. Het huidig artikel is voor een d eel een update (tot en met 2008) van het vorige. Tevens worden de verkeersovertredingen nader bekeken. Behalve de verkeersstatistieken van de Curaao Road Services (CRS), de Vereniging Veilig Verkeer Curaao (VVV) en de wagenparkgegevens van het Ontvangers kantoor, is ook het Jaarverslag van het Openbaar Ministerie van de Nederlands e Antillen geraadpleegd. Een stukje geschiedenis Na 1910 reed de eerste auto over de Curaaos che wegen. Voorheen legde de bevolking lange afstanden af te voet. Van Bandariba en Bandabou liep men naar Otrobanda en Punda en terug. Wat later deed de ezel dienst als vervoermiddel. De me er welgestelden gebruikten paard en muilezel om zich te verplaatsen. Men maakte karretjes met zitplaatsen en vrachtruimte, waardoor personen en vracht tegelijkertijd vervoerd konden worden. In 1920 had men op Curaao 200 autos. In 30 jaar tijd (1950) is dit tot 35 maal zoveel opgelopen (7000). De verkeersdrukte heeft de overheid ertoe gebracht wegen aan te leggen en verkeersborden en -lichten te plaatsen. (Bron: Vereniging Veilig Verkeer Curaao). Bijna zes decennia later (2008) rijden circa 11 maal zoveel personenautos (76520) rond op het eiland Tabel 1 Aantal geregistreerde mo torrijtuigen 2002-2008 per december 31 2002 2003 2004 2005 2006 2007 2008 Mutatie 2002-2008 in % Curaao Personenautos 62211 53259 60590 64931 67328 70515 76520 +23 Motor lorries en pick-ups 15028 11713 12785 13578 14565 15066 15405 +2,5 Motorbussen 430 445 438 486 493 435 439 +2,1 Taxis 196 199 191 186 194 192 190 -3,1 Overige motorrijtuigen 191 166 207 299 285 296 +55 Motorfietsen, incl. mopeds 1027 891 1037 1166 1365 1531 1754 +70,8 Bron: Ontvangerskantoor *) Exclusief motorvoertuigen in het bezit van de overheid Behalve voor de categorie taxis is voor alle ca tegorien voertuigen een toename waarneembaar van 2002 tot 2008. Voor motorfietsen, overige moto rrijtuigen en personenautos is de stijging respectievelijk ruim 70, 55 en 23 procent. Modus Statistisch Magazine Nummer 2 en 3 41 Ontwikkeling rele BBP 2006-2009 De periode 2006-2009 kenmerkt zich door een econ omische recessie die in de VS ontstond met het instorten van de huizenmarkt in augustus 2007. De instorting van de huiz enmarkt heeft als gevolg gehad dat hypotheekkosten niet langer opgebracht konden worden. Hypotheekbanken gingen failliet en Amerikaanse beurzen vertoonden een sterke daling. De effecten van de crisis waren o.a.de volgende: ineenstorten van het vertrouwen in de economie terugvallen van de vraag van de consumenten afname van de wereldhandel dalende grondstofprijzen, w.o ruwe olie dalend exportvolume en aangetaste aandelenmarkten Vanwege de internationale economische relatie die de VS met de rest van de wereld onderhoudt, heeft de crisis ook doorgewerkt in andere delen va n de wereld. Dit alles heeft ertoe geleid dat de wereldeconomie steeds verder achteruit ging. Va nwege daling in consumptie en investeringen krimpt de wereldeconomie steeds verder in tot een niveau van -0,8 procent in 2009, het laagste ooit gemeten sinds de tweede wereldoorlog. Deze achteruitgang is vooral te wijten aan een inkrimping in de economie van de ontwikkelde landen, van 3,0 procent in 2006 naar 3,2 procent in 2009. In de opkomende en ontwikkelingslanden is er nog sprake van een groei van 2,1 procent in 2 009, maar ook voor deze groep landen is 2009 een dieptepunt. (zie grafiek 1). Hieronder volgt een nadere analyse van de rele groei van het BBP in deze twee groepen van landen. Ontwikkelde landen In deze groep is in alle landen de rele groei onder de nul procent. Het zijn vooral Japan, het Verenigd Koninkrijk en de Europese Unie die sterk achteruit zijn gegaan. Japan noteert een achteruitgang van 7,7 procentpunten en wel van 2,4 pr ocent in 2006 naar -5,3 procent in 2009. Ook het Verenigd Koninkrijk gaat er met 7,7 procentpunten op achteruit, van 2,9 procent in 2006 naar -4,8 procent in 2009. In de Europese Unie is de economie met bijna 7 pr ocentpunten gedaald, van 2,8 procent in 2006 naar 3,9 procent in 2009. Vooral Duitsland en Itali zijn verantwoordelijk voor deze achteruitgang (zie tabel 1). Canadas economie krimpt van 2,8 procent in 2006 naar -2,6 procent in 2009, een terugval van 5,4 procentpunten. Ook de economie van de VS stort in met 5,4 procentpunten, van 2,9 procent in 2006 naar -2,5 procent in 2009. 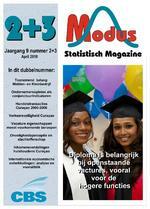 Modus Statistisch Magazine Nummer 2 en 3 43 van 8,2 procent in 2006 naar -7,5 procent in 2009. In 2007 noteerde dit land nog een groei van 8,5 procent. De economie in Centraal en Oost Europa vert oont een achteruitgang van 10,9 procentpunten tot een niveau van -4,3 procent in 2009. Latijns Amerika s economie gaat met 7,8 procentpunten achteruit van 5,5 procent in 2006 naar -2,3 procent in 2009. In deze groep is het vooral Mexico wier economie sterk achteruitgaat van 5,5 procent in 2006 naar -6,8 procent in 2009. Verwachting 2010-2011 De wereldeconomie zal met name dankzij de opko mende Aziatische landen enigszins uit het dal klimmen. Het herstel echter gaat niet overal even snel. Geen enkel land zal de komende 2 jaren nog op het niveau van vr de recessie komen. Volgens de cijfers van het IMF wordt voor 2010 en 2011 een economische groei van rond de 4 procent verwacht. Ontwikkelde landen Uit analyse van tabel 1 blijkt dat het de opkomende landen zijn waaraan deze groei is te danken. Het rele BBP in deze groep van landen zal met 6,0 procen t stijgen. Landen die vera ntwoordelijk zijn voor deze 6,0 procent groei liggen in de groep van Opkomend Azi, die met 8,4 procent reel vooruitgaan. De economie van China zal met 10, 0 procent stijgen en India met 7,7 procent. Het is vooral de sterke binnenlandse vraag in beide landen die een bijdrage levert aan deze positieve ontwikkelingen. Opkomende en ontwikkelingslanden De economie in de ontwikkelde landen zal met ru im 2 procent toenemen. Landen aan wie deze groei toegeschreven kan worden zijn de Overige ontw ikkelde landen, Verenigde Staten, Canada, het Verenigd Koninkrijk en Japan. In 2010 zal hun economie met respectievelijk 3,3, 2,1, 2,6, 1,3 en 1,1 procent groeien. In 2011 staan ook deze 5 landen aan kop hoewel de Overige ontwikkelde landen (3,6%), Canada (3,6%) en het Verenigd Koninkrijk (2,7%) sterker zullen groeien dan de VS (2,4%) en Japan (2,2%). Binnen de Europese Unie zijn het vooral Duitsland en Frankrijk die in beide jaren opvallen. Hoewel Spanje in 2011 een positieve groei zal doormaken, is het in 2010 n van de weinige landen in de Europese Unie die onder de recessie zal blijven. Samenvatting en conclusie In de ontwikkelde landen vind er een steeds verd ere achteruitgang van de economie plaats tussen 2006 en 2009. Het zijn alleen het Verenigd Koninkri jk en de Overige ontwikkelde landen die in 2007 iets sneller groeien dan in 2006, maar verv olgens zwakt hun economie ook verder af. De economie in de opkomende en ontwikkeli ngslanden bereikt in 2007 een hoogtepunt om vervolgens in 2008 wat af te zwakken. Voor bepaalde landen wordt dit zelfs negatief. Het ziet er naar uit dat de wereldeconomie, gelet op de ontwikkelingen van het rele BBP, zich zal herstellen na de economische recessie die in 2007 be gon. Alhoewel nog niet op het niveau van vr de crisis zal in 2010 een positieve groei worden genote erd, die zich in 2011 verder zal uitbreiden. De opkomende industrien, geleid door China en Indi a, zullen met een groei van 6 procent het grootste deel van de wereldgroei voor zich nemen. Chin as economie zal zelfs met 10 procent groeien. De ontwikkelde landen daarentegen zullen met een groei van ruim 2 procent een kleiner deel van de wereldeconomie voor hun rekening nemen. De economie van vooral het Verenigd Koninkrijk, Canada, de Verenigde Staten en Japan zal het hardst groeien. Modus Statistisch Magazine Jaargang 9 44 Household income and income distribution, Curacao from 2003 through 2008. Martha Victoria This article presents data on the income development and income distribution of households in Curacao, from the years 2003 through 2008. Data on household income is obtained from the Labor Force Survey (LFS) 2003 through 2008, a sample survey which is conducted by the Central Bureau of Statistics every year. Interpreting the analysis presented in the article, the reader should take the following into account: Income data gathered from the LFS are expressed in gr oss terms. No allowance is made for direct taxes and social contributions to arrive at net disposab le income, which is a be tter indicator for income distribution analysis. All sample-based statistics are subject to sampling error. A more reliable source of household income data would be the population census, but since the last census was conducted in 2001, more recent data from the LFS was chosen to assure actuality. From 2003 through 2008, incomes have been deflated with respect to the consumer price index (CPI) 2006, to compare developmen ts between 2003 and 2008. The income of households includes the income of the head of household and all other individuals 15 years and older in the household. For the purpose of analysis, the incomes are equivalised The equivalent income is defined as the household income of the individual adjusted fo r differences in household size. The assumption underlying an equivalent income measure is that larger households need more income than one-person households to reach a given level of economic well-being. This article begins with a section discussing the inco me development, followed by a section on differences in income distribution of household income. Modus Statistisch Magazine Nummer 2 en 3 45Measuring the development and distribution of income The median income simply identifies the income le vel of the household in the middle of the income distribution, while mean (average) income is calculated by dividing the total aggregate income of a group by the number of units in that group. From 2003 to 2004, mean household income rose with a robust 59 percent. At the same time, the median household income rose by 54 percent. According to table 1, in 2005 and 2006 the average household income has been in decline, while in 2006 and 2007 there has been an increase of ar ound 9 percent. Between 2007 and 2008 has been another decline from ANG 2,269 to ANG 1,911, a decline of around 16 percent. In addition, the mean household income headed by male and female ho useholds -between 2003 and 2008has decline by around 10 and 14 percent respectively. In 2004, the median household income has increased by around 54 percent. The years after, the median income has been fluctuating till its lowest point in 2008 from ANG 1,605 to ANG 1,312, which is around 18 percent decline. The median household incomes of male and female headed households have decreased by around 7 and 5 percent respectively between 2003 and 2008. Table 1. Type of households by equivalent income, ANG 2003 2004 2005 2006 2007 2008 Mean income All households 2208 3502 2190 2075 2269 1911 Male headed households 2556 4303 2615 2456 2641 2298 Female headed households 1667 2353 1595 1553 1791 1426 Median income All households 1520 2347 1391 1493 1605 1312 Male headed households 1823 3152 1737 1864 1961 1697 Female headed households 1010 1538 956 1020 1191 956 Differences in income distribution Income distribution refers to how evenly the total amount of income in an economy is divided between all households. The percentages of households in the different inco me groups have been fluctuating over the years. The group of households earning below ANG 1,000 has risen by 8 percentage points in 2008 compared to 2007. All other income categories (a bove ANG 1,000) have declined between 2007 and 2008. The most prosperous years are 2004 and 2005, ha ving the lowest percentages (23 and 24 percent respectively) of households in the income category ANG 1,000 and under, and higher percentages of households in the income category ANG 5,001 and up. Modus Statistisch Magazine Nummer 2 en 3 47 Only 7 percent in the age group 60+ earn more than ANG 4,000 in 2008, while 15 percent of those between 40-59 years have incomes exceeding ANG 4, 000. In the income category between 2001-4000 guilders, the percentages have been fluctuating ov er the years in all age groups. In 2008, the age group 15-39 has the highest percenta ge households in the income category 2001-4000 (25%). The other age groups 40-59 and 60+ have had respectively 24 an d 20 percent households in this income category (see table 4). Table 4. Distribution of equivalent income by age, % 2003 2004 2005 15 39 40 59 60+ 15 39 40 59 60+ 15 39 40 59 60+ <------1000 34 31 42 21 20 26 17 22 30 10012000 29 25 27 22 17 25 25 18 24 20013000 12 14 16 19 15 15 18 13 16 30014000 10 11 7 10 12 9 15 10 9 40015000 5 8 2 7 8 7 6 8 6 5001------> 10 11 6 21 28 18 19 29 15 Total 100 100 100 100 100 100 100 100 100 2006 2007 2008 15 39 40 59 60+ 15 39 40 59 60+ 15 39 40 59 60+ <------1000 33 32 40 25 26 39 37 33 45 10012000 29 27 29 34 27 29 30 28 28 20013000 13 16 13 17 18 15 16 16 13 30014000 10 8 7 7 10 8 9 8 7 40015000 6 7 5 7 6 4 2 6 3 5001------> 9 10 6 10 13 5 6 9 4 Total 100 100 100 100 100 100 100 100 100 According to table 5, most households with high er education are the ones earning ANG 5,001 and more, while most households with lower education earn less than ANG 1,000. In 2008, 68 percent of lower educated households have been earning lesser than ANG 1,000 and 93 percent lower than ANG 2,000. This is the highest percentage if compare to previous years. The second highest percentage was in 2006 (62 %). Only 1 percent of lower educated households earn more than ANG 4,000. Middle educated households were the second high est in the income category lower than ANG 1,000 (37%) in 2008. 71 Percent earn less than ANG 2,000. These percentages are the highest if compared to past years. Also the percentages of middle educ ated households earning above ANG 4,000 have decreased from 11 percent in 2007 to 5 percent in 2008. 25 Percent of high educated households earned AN G 5,001 and up in 2008. In comparison to past years, 2008 was the year with lesser high educated households in the higher income category. The years with the highest percentages were 2004 (64 %) and 2005 (69 %). Modus Statistisch Magazine Jaargang 9 48 Table 5. Distribution of equivalent income by education, % 2003 2004 2005 Income low middle high low middle high low middle high <------1000 57 32 4 40 20 2 45 20 1 10012000 30 29 10 30 22 3 29 23 2 20013000 10 18 12 14 18 10 12 18 8 30014000 2 11 18 6 13 8 7 12 10 40015000 0 5 17 3 8 13 3 8 10 5001------> 1 5 39 7 19 64 4 19 69 Total 100 100 100 100 100 100 100 100 100 2006 2007 2008 Income low middle high low middle high low middle high <------1000 62 32 4 54 28 2 68 37 4 10012000 27 32 11 34 31 11 25 34 14 20013000 8 18 17 9 20 15 5 16 25 30014000 2 9 17 3 10 13 1 8 17 40015000 1 5 18 0 6 16 0 2 15 5001------> 0 4 33 0 5 43 1 3 25 Total 100 100 100 100 100 100 100 100 100 Conclusion The amount of households in the different income ca tegories have been fluctuating over the years. In summary it is observed that 2008 is the worst year for households. Both mean and median incomes have decreased between 2007 and 2008. 2008 Has the lowest mean and median income if compared to previous years. The same counts for male and female headed households. Household income distribution has changed during th e years under consideration. In 2008, 39 percent of all households earned a monthly income of ANG 1,000 or less. This makes the income category of ANG 1,000 or less the category with the highest percentages over the period 2003-2008. The income distribution differs between the sexes, ages, and education. More than half of all women earned ANG 1,000 or less in 2008. For men, more than a quarter have an income that falls into this income bracket. Of the elderly, 45 percent has an income of ANG 1,000 or less. This share is much lower for the youngest age group (37%) and lowest fo r the middle-aged households (33%). Households in the age group 40-59 earn more often ANG 5,000 and more (9%), than younger (6%) and older (4%) households. Highly educated households earn more than lo wer and middle educated households. In 2008, 68 percent of lower and 37 percent of middle educated households earn less than ANG 1,000. Only 4 percent of highly educated households earn less than ANG 1,000.